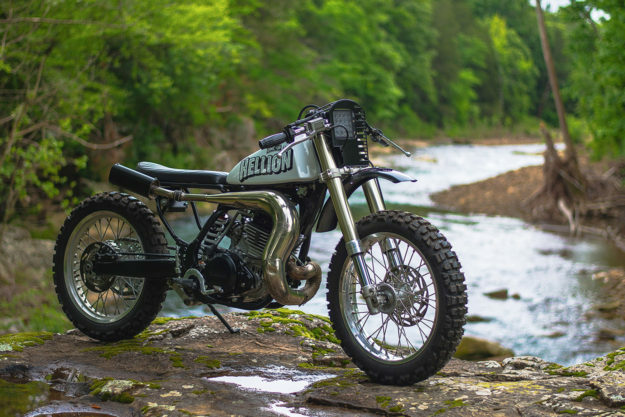 The combination of dual sport tires and clip-ons on this Yamaha will probably leave some of our readers clutching their chests. And builder Art Henschell is totally down with that. 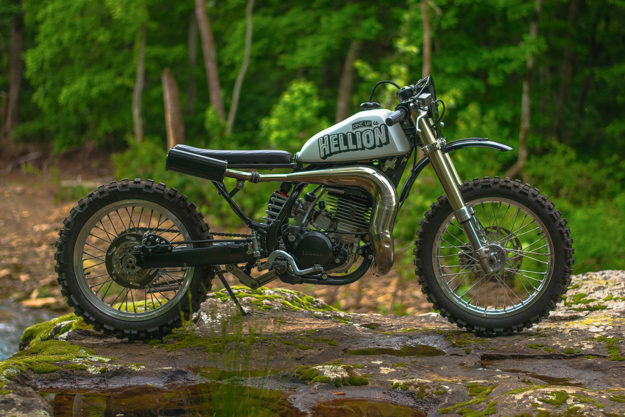 He’s even emblazoned this Yamaha WR500 with a big, fat warning label: ‘HELLION.’ We think it’s hella rad, so we got in touch to find out more. 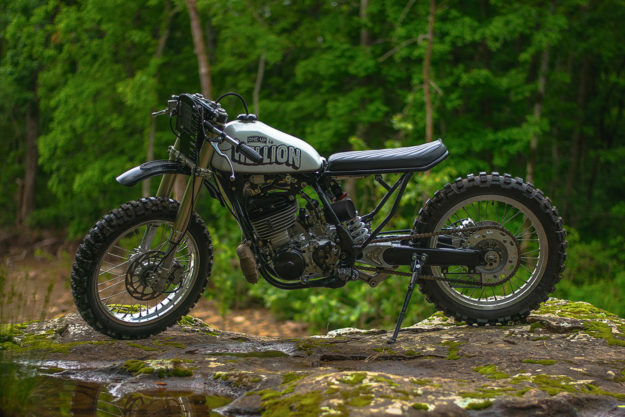 Art runs One-Up Moto Garage in Fayetteville, Arkansas. 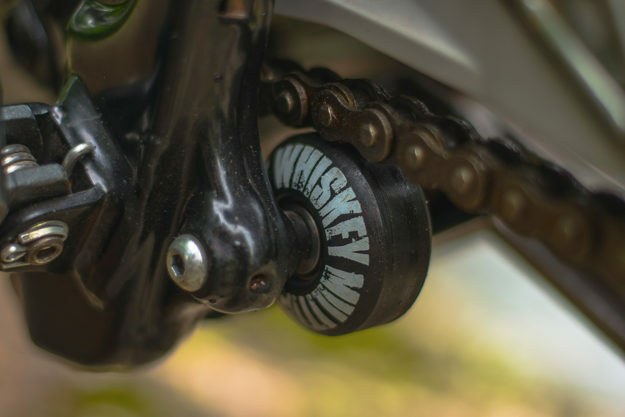 He’s only in his mid-twenties, but he’s been wrenching since the age of seventeen—and even paid his way through college with moto work. 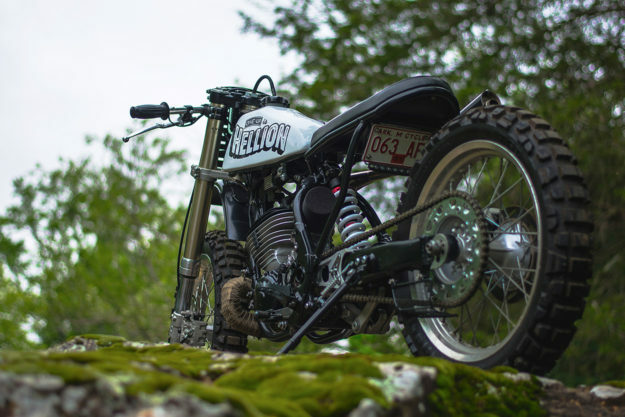 It took him a while to tackle a big, air-cooled two-stroke through—despite harboring a love for them. 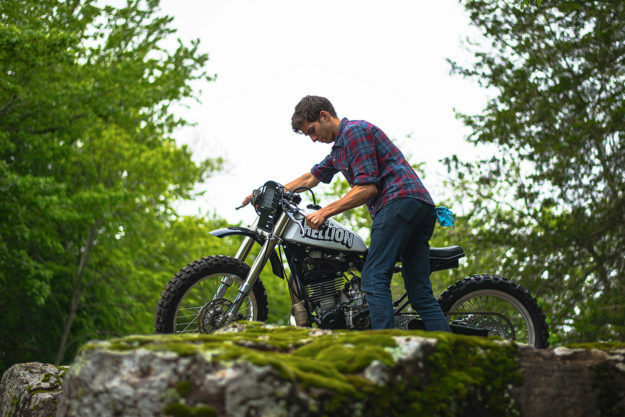 With help from fellow One-Upper Micah Welsh, Art began stripping the bike down to the basics. Rather than start with a sketch or rigid plan, Art finds a gas tank that works with the lines of the engine and the frame. In this case, a 1981 Suzuki DS100 tank fitted the bill. 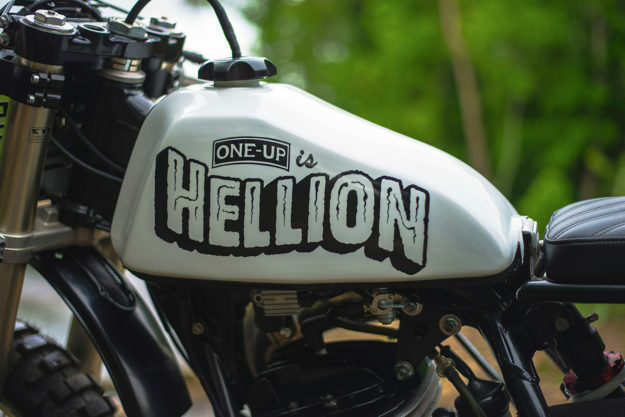 The tank was restored and sent off to sign-painter Eric Snodgrass, to badge with its new moniker. 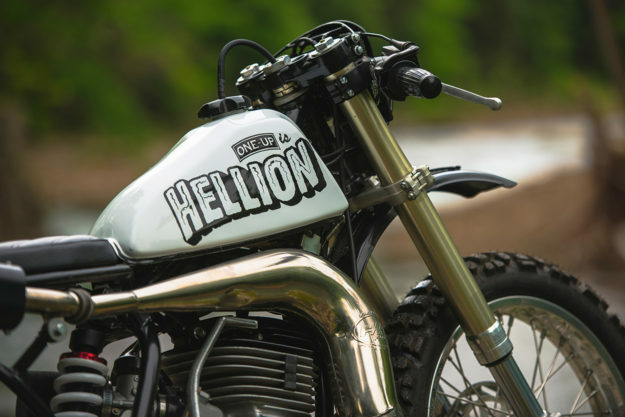 Why ‘Hellion’? 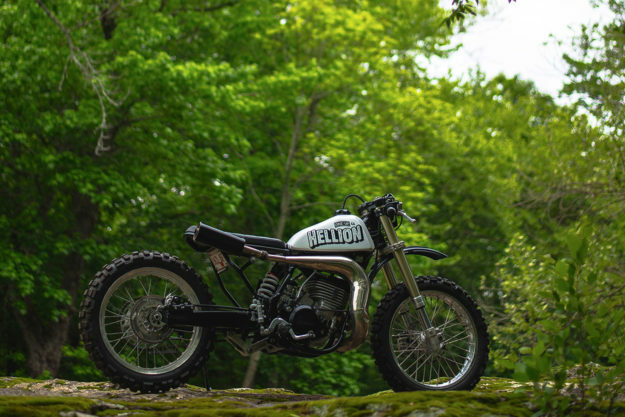 “I deemed it appropriate, given the monstrosity of devilish two-stroke prowess I was dealing with,” explains Art. The typeface, in case you’re wondering, was inspired by an old movie poster for The Creature from the Black Lagoon. Next up, the WR500’s dirt bike rear end was redesigned to flow from the tank. A bare-bones seat sits on top—shaped and upholstered from scratch by Art. There’s not much else in the way of bodywork, but what’s present is all hand-made. 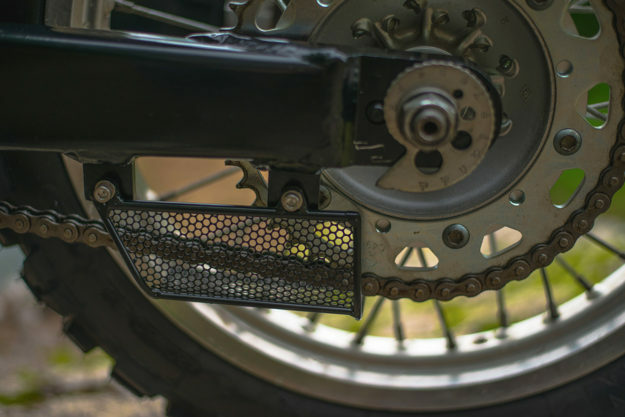 That includes the front fender and the quirky, LED-equipped headlight assembly—plus smaller bits like the chain guard, plate bracket and tail light mount. The cockpit is minimal—with mini switches and an empty bracket where a speedo should be. Art specs his bikes to run with a smart phone as a speedo, so he sourced an iPhone 6 case (to match his client’s phone) and mounted it. 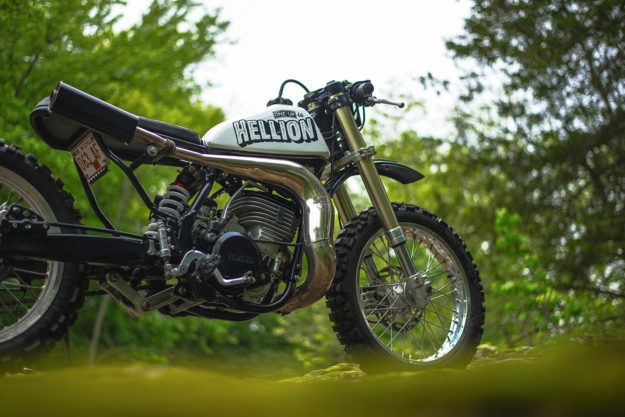 The exhaust system is a full gold-chrome FMF system that came with the bike, which Art claims “is more rare than a well-tuned Harley.” He simply polished up the expansion chamber, then shortened, repacked and powder-coated the silencer. “The exhaust isn’t in a burn-your-leg position like it appears,” he promises. 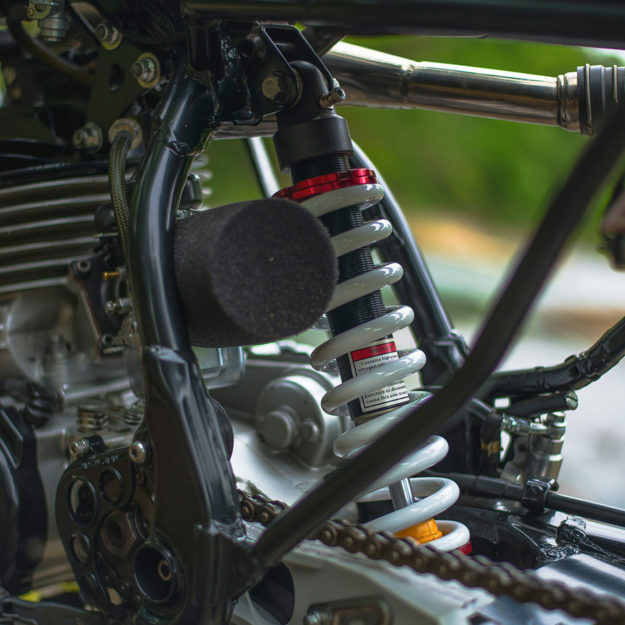 To improve the suspension, Art has tweaked the front forks and fitted a slightly shorter Blygo shock at the back. He’s rebuilt the stock rear wheel, and swapped the front out for a matching 18-inch, with a new rim laced to the original hub. Michelin T63s round out the package. 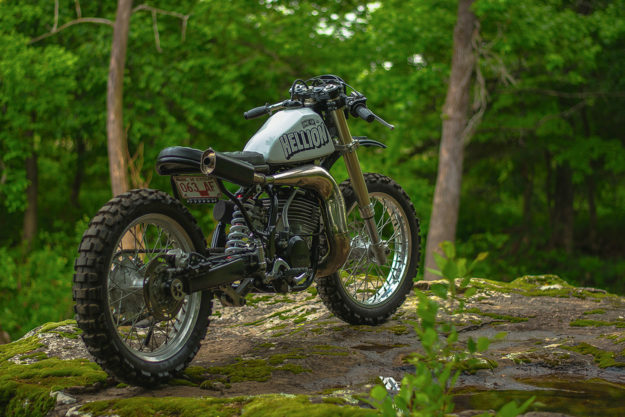 Despite the WR500’s outlandish new look, this is no rat bike. Everything’s been painted, polished or powder coated. And there’s a ton of work lurking under the hood too. The motor’s been rebuilt, and all the little perishable bits (like bearings and gaskets) replaced, front to back. There’s a brand new, simplified wiring harness. Sounds hella good to us.